Edit: Enlarged Image, and added guide to tangles used as requested. Well for the Zendala Dare this week I decided to really push myself. I have been trying to make my recent tangles like onions, no not stinky. I am trying to add layers. I think I did a decent job on this one, I am calling it “The thin in the basement,” I was planning on doing extra shading and making each layer of rings also look more like it was floating on the one under it, but I forgot. It happens. 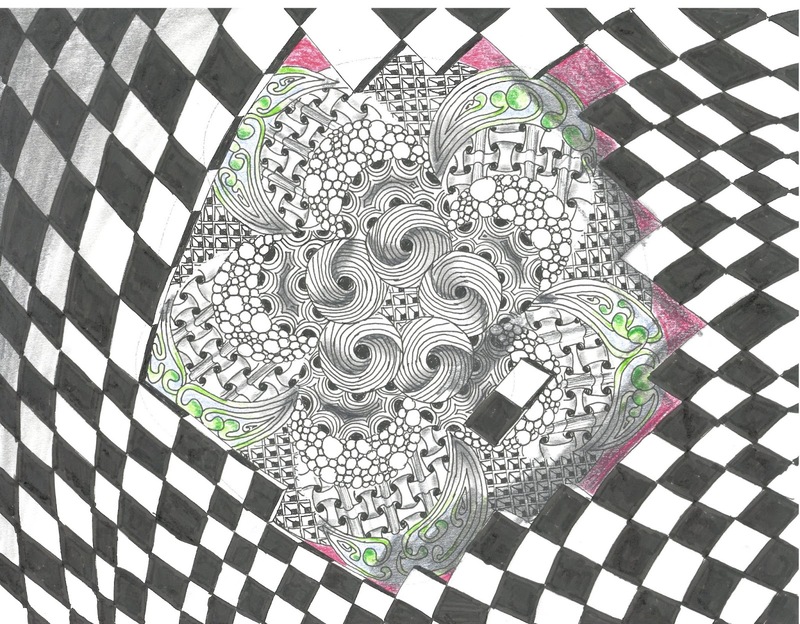 I also pushed myself to tangle outside the bounds of the pattern, and that is where the “Floor” comes from. I added just a touch of color, as I still prefer black & white. I also added the new technique for the Diva’s Challenge #109 in here also. Lastly I tried to use almost all tangles with curving shapes for the "thing," only adding cubine behind it for a 3rd layer. All in all am happy with the way it turned out. Beautiful and original Roy! You have chosen great tangles and the 'floor' is great. I have two suggestions: one, could you post this a little larger? And two, could you list the tangle names under it? I love it when tanglers post their tangle names. It is like a gift to us all. Really...this is a wonderful and amazing Zentangle! Very nice. I like your thought process with this one. You are so ambitious and I am lovely what I see!